We love to share honest reviews of not only the tools we use in our business but tools we think you could benefit from using too. Today, we take a closer look at Ninja Outreach and explain what we like and what we dislike about it. Please read the entire contents of this review before you make any decisions to buy and use NinjOutreach. I’m always on the lookout for promising new tools that I think could improve productivity and save time in my business. My time is precious, as is yours, I know. So I always appreciate the time YOU take to come over and read my blog. So, I discovered Ninja Outreach some years back now. I believe it was around 2015. At the time of signing up and trying out some of the features in the web-based software, I was pretty impressed. For the most part, NinjaOutreach did just what it was designed to do “Save time and increase productivity” when doing influencer or blogger research and content marketing. Over the years, Ninja Outreach has somewhat improved its core products, however, some issues have come to light regarding its services and how the company conducts themselves. I’ll explain later in this post. What is blogger outreach anyway? If you don’t already know, blogger outreach is the process of reaching out and connecting with successful bloggers and influencers in your niche or industry. Why would you want to reach out to bloggers and influencers? Well, because influencers, for the most part, have a lot of authority and credibility. There will be many bloggers and influencers in your niche that already have established themselves well. They will have a target audience and customer base that you can tap into. Reaching out and getting onto their radars is a very effective way to get your content, products, services, and everything else you have to offer noticed by your influencers and their audiences. By leveraging your influencers authority, credibility, audience reach, and everything else in between, you can catapult your marketing and get better ROIs for your efforts. You can, of course, do blogger or influencer outreach without the use of a tool or platform like NinjaOutreach, however, the process would be extremely time-consuming and require a lot of resources. That’s where Ninja Outreach comes in. 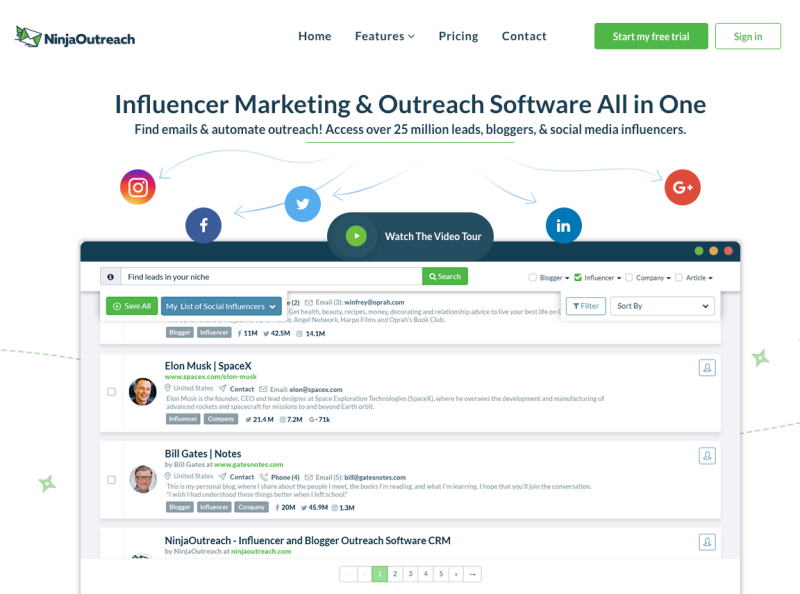 Again, NinjaOutreach, from what I can understand was originally designed to help you save time finding influencers in your industry. Disclaimer: Before I continue, I want to disclose very quickly that I did NOT purchase Ninja Outreach for myself. I was, in fact, contacted by one of the founders of the software, Dave Schneider, and asked if I would be interested in checking it for my own use. Dave set me up with a free account and I was able to test drive Ninja Outreach for a couple of months, before making up my mind whether I thought the tool was going to be useful or not. The decision to write this review was completely my own. The purpose of this review is to let you know whether I think NinjaOutreach is worth your time and money, or not. How does Ninja Outreach work? 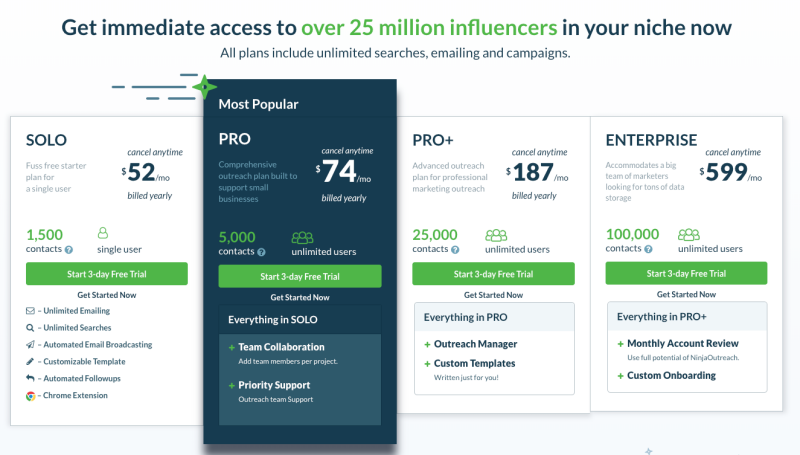 This is an outreach and prospecting software for bloggers and entrepreneurs, or for anyone looking for a more efficient and rapid way to reach out and connect with bloggers, small business owners, freelancers, agencies, influencers, and more. Search for prospects and influencers, currently, there’s over 25 million added to their database. 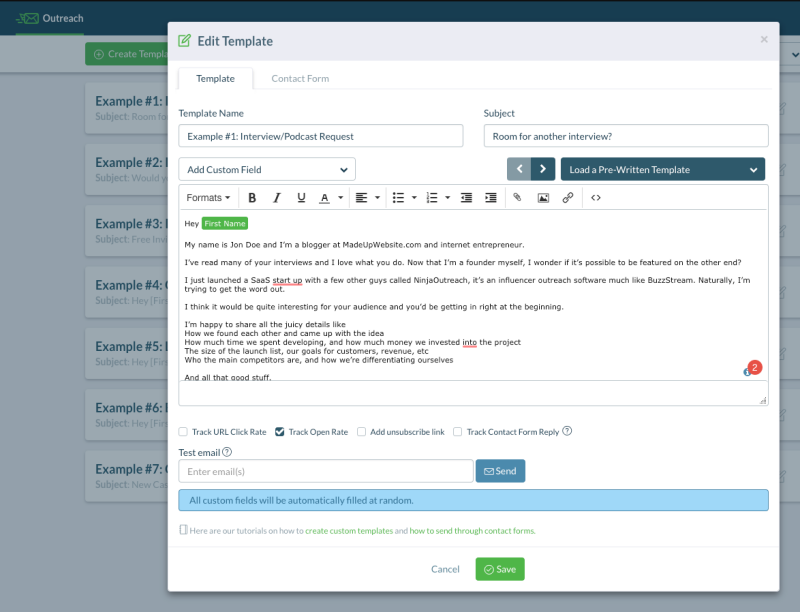 Create and manage email outreach templates. Get access to a ton of other unlimited features (See price list below). So, let me give you a quick demonstration of how I would personally use Ninja Outreach for my own project. Let’s say I was thinking about putting together an expert roundup list post about website conversion rate optimization to be published on my blog, or on a guest blogging website. I would simply use Ninja Outreach to first do a search for something like “website conversion tips” or “how to boost website conversions”, or something along those lines. 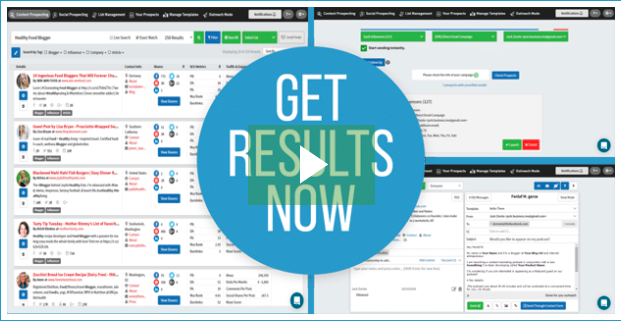 The Ninja Outreach software would then do a live search and generate results of relevant websites, pages complete with social and SEO insights and metrics, contact details, traffic and engagement information and more. See image below. Once I have this information available, I can then start sifting through and add any appropriate sites, pages, etc to my custom prospects list for later on. See image below. Other things I can do is import a bunch of URL’s that I might want to research, or export to CSV to view later on offline. There’s a video on the homepage of NinjaOutreach that will show you how this is done in greater detail, so take some time to watch it. OK, so once I have my list of prospects created, I can then begin constructing my outreach email template, or I can use one of the ready-made templates provided in my NinjaOutreach dashboard. See image below. In the email body, I would simply introduce myself, and explain that I’m putting together an expert roundup post where I would love them to answer a question or two. So, that’s just a quick demo of how I would use Ninja Outreach myself, however, it doesn’t stop there. 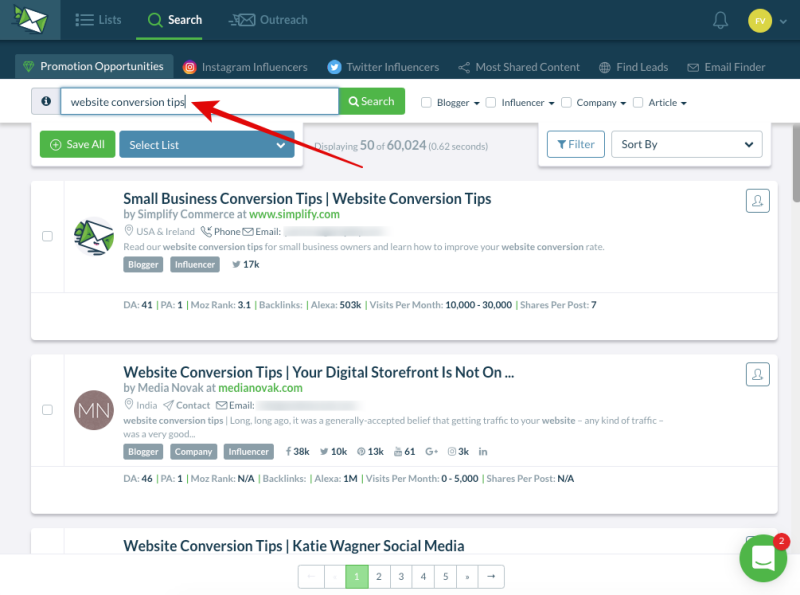 I can also use the CRM to find targeted guest post friendly blogs that might be interested in publishing my expert roundup post. Blogs that are hosting giveaways and contests. Blogs that publish product reviews. Blogs that accept infographics and videos. In-depth blog and video tutorial guides for using Ninja Outreach. So is this tool right for everyone? Yes, it’s right for everyone and anyone interested in saving time and resources when doing any influencer marketing or blogger outreach email campaigning, whether it’s for themselves or a client. OK, so there are 4 plans to choose from with Ninja Outreach. See image below for pricing structure. As you can see from the above, Ninja Outreach is not cheap. For example, for unlimited users at $74 per month amounts to $888 per year. For big team players at $599 per month amounts to a skull-crushing!!! $7,188 per year… Really? I’ve been using Ninja Outreach for a few years now, so I’ve concluded a list of pros and cons I’ve found since starting using it. And, at the time of updating this post in November 2018. You get 3-days trial access. Used to be 14 days! Easy to use, improved user-interface. Great assistance with practical video tutorials available in the knowledge database. Huge time-saving tool, ultimately that’s the biggest selling point here with Ninja Outreach. Over 25 million influencers already added to their database. Expensive. In fact, way too expensive… The cheapest plan will set you back a choking $624 per year, so be careful before you commit because Ninja Outreach has a no refund policy. Possible email spamming. My other concern with Ninja Outreach is with regards to email spamming. Emails sent from the software could easily be flagged up, and I think that could cause some serious concerns for some bloggers and marketers. Especially with GDPR in play. I’m not entirely sure how this is handled by Ninja Outreach, however, my only thought is that once the software has been established more, as in more people within the industry know about it and are using it, then this might not be so much of an issue. But, for the most part, I have stopped using NinjaOutreach for blogger outreach, but continue to use it for doing content research. Poor customer support. I can’t give praise to their customer support team either, personally, because each time I’ve been in touch with customer service I’ve had no response! In addition, from the reviews that I’ve read of the customer support for NinjaOutreach on other websites, it would seem that this is another area that the company is lacking, sadly. Broken management. Something has happened to the management team over at Ninja Outreach, I really don’t know what though. I say this for several reasons, the number of complaints that I’ve read about the billing system on other websites is a concern, and I just feel the overall service has gone downhill slightly. Do I “personally” recommend using Ninja Outreach in 2019? It’s a tough one. If you’d asked me that question a few years ago, my answer would have been a Yes! without hesitation. Yes, I get that everything you need for doing influencer marketing is provided under one roof, one website so to speak. Plus, in all fairness to Ninja Outreach, their tools are decent enough. However, the plans are quite expensive, there’s the issue of possible email spamming when using the email tools, and the inadequate customer support with a zero refund policy makes them not as attractive as they were a few years ago. Another issue I’ve not highlighted is that some parts of their website appear broken, as in page not found and pages with broken CSS! All these little things are signs of a company going downhill, which is a shame. That being said, you’re welcome to try them out at your own risk. I still believe in the company and the services it provides, and hopefully, before it comes to updating this review again, they will have turned things around. Disclaimer: This is not a sponsored post, I have not purchased this software myself. I was simply given a free license by OutreachNinja to test drive the CRM software. To test out the features and make up my own mind whether I thought it was useful or not. Affilaite Disclaimer: This post contains affiliate links, this means if you click on one of these links to the Ninja Outreach website and purchase the service, I will be paid a small commission, at NO additional cost to you. I appreciate your support. You can read my full disclaimer by following the link in the footer of this post.